•Toby Candies, 50, of 296 Whitley Road in Des Allemands, was arrested on Jan. 20 and charged with simple burglary. •Michael T. D’luca, 27, of 41200 Clearwater Ave. in Gonzales, was arrested on Jan. 22 and charged with extortion. •Joshua N. Pleming, 24, of 305 W. Oakland Drive in St. Rose, was arrested on Jan. 23 and charged with DWI and improper control of vehicle. •Marco A. Guandique, 36, of 3808 Veterans Blvd. in Metairie, was arrested on Jan. 23 and charged with DWI, reckless operation and driver not licensed. •Charles Harding Jr., 45, of 1112 Kinler St. in Luling, was arrested on Jan. 21 and charged with possession of heroin and as a fugitive from the Jefferson Parish Sheriff’s Office. •Gavin J. Terrebonne, 21, of 226 W. 112th St. in Cut Off, was arrested on Jan. 18 and charged with possession of clonazepam and possession of drug paraphernalia. •Wilbert Young, 51, of 702 Paul Frederick St. in Luling, was arrested on Jan. 19 and charged with possession of marijuana third offense. •Heather L. Bergeron, 19, of 316 Canal St. in Luling, was arrested on Jan. 19 and charged with possession of marijuana second offense, possession of drug paraphernalia and disregarding a stop sign. •Dylan P. Weber, 20, of 11585 N. Harrells Lane in Baton Rouge, was arrested on Jan. 21 and charged with possession with intent to distribute marijuana. •Shannon L. Mitchell, 20, of Post St. in Killona, was arrested on Jan. 21 and charged with possession with intent to distribute counterfeit marijuana, use of a firearm, two counts of illegal use of a controlled substance in the presence of a juvenile and possession with intent to distribute drug paraphernalia. •Jonathan P. Jones, 31, of 167 Rue Landry in St. Rose, was arrested on Jan. 21 and charged with possession of amphetamines, criminal trespass and a St. Charles Parish Sheriff’s Office attachment. 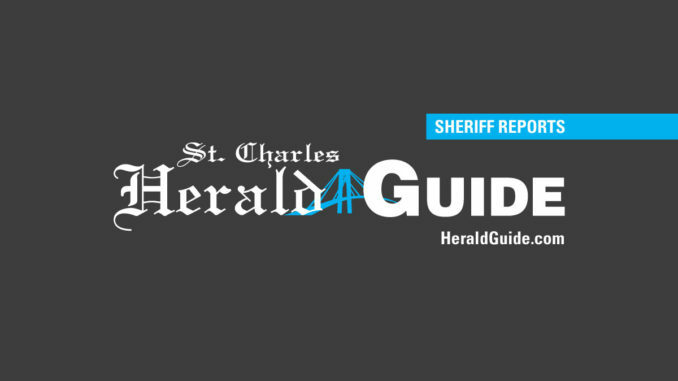 •Jared M. Ritter, 31, of 19 Holster Lane in St. Rose, was arrested on Jan. 21 and charged with possession of amphetamines and a St. Charles Parish Sheriff’s Office attachment. •Hamilton Jenkins III, of 2657 N. Conti St. in New Orleans, was arrested on Jan. 21 and charged with possession of a stolen auto over $500.